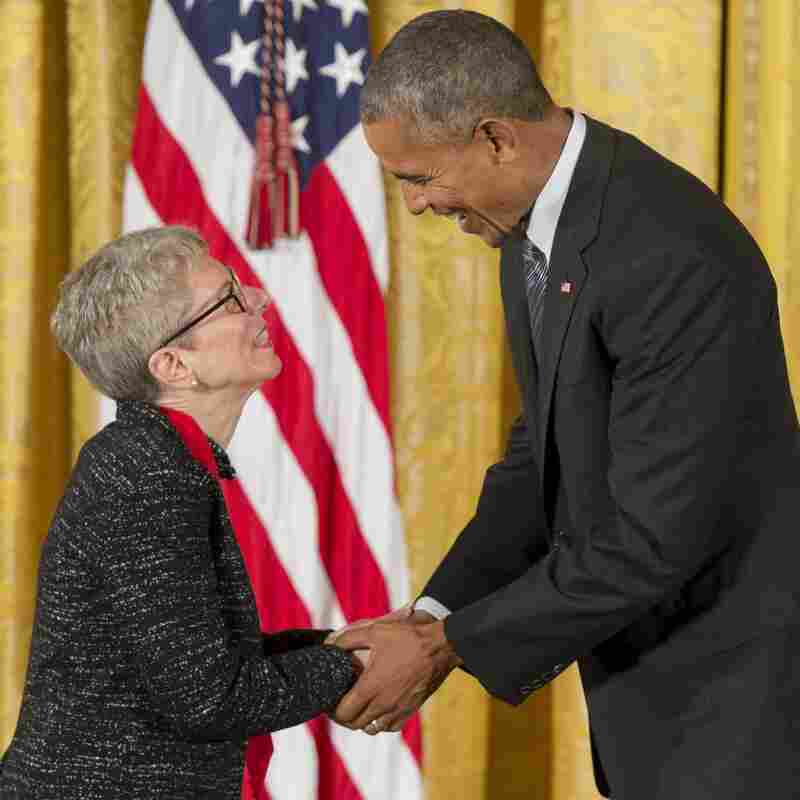 2015 National Medal Of Arts And National Humanities Medal Ceremony: Winners And Live Video : The Two-Way Two dozen luminaries — from Terry Gross to Mel Brooks, Morgan Freeman to Louise Glück — got laurels Thursday, as President Obama awarded the National Medals of Arts and National Humanities Medals. 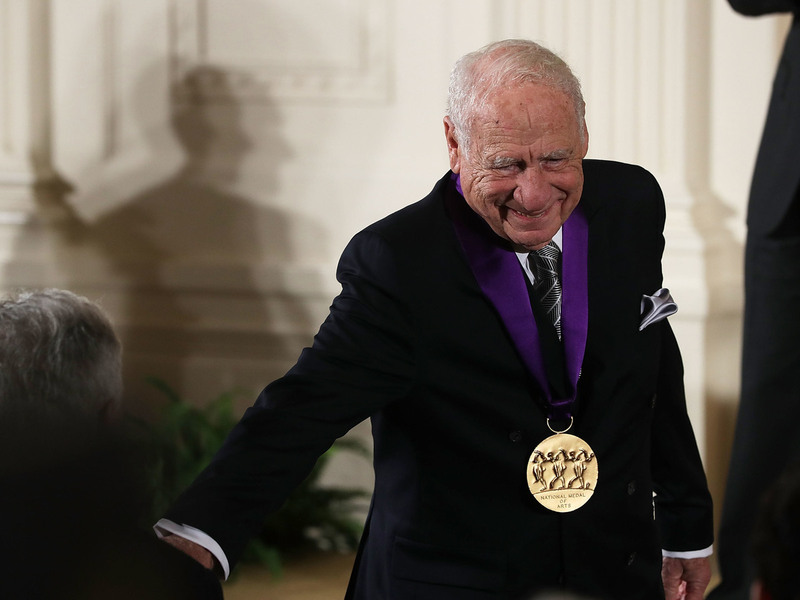 Mel Brooks receives the National Medal of Arts during an East Room ceremony at the White House on Thursday. Say one thing for certain: The lists don't lack for leading lights. When President Obama doled out the 2015 National Medals of Arts and National Humanities Medals on Thursday, plenty of the artists and arts patrons he draped with awards had familiar names — including Mel Brooks, Morgan Freeman, Terry Gross and nearly two dozen others. Yet even amid the hoopla, meant to laud both artistic achievement and support of the humanities in the U.S., it's striking that Thursday's ceremony also celebrated something a little more subtle: the humble ampersand. Nearly all of the names below have played so many roles — from producing music to speaking with musicians, from dancing on stage to flambéing behind kitchen doors — we'd be hard-pressed to speak of them were it not for that little word "and" tying all their undertakings together. And behind it all is the pursuit and cultivation of meaning, says Gross. The longtime host of Fresh Air has interviewed about half of her fellow honorees over the years. "I find a lot of meaning in my work. I think meaning is something that one has to find in life," Gross tells NPR's Robert Siegel. "Life doesn't come with inherent meaning — I mean, all life is meaningful, but you, as somebody living your life, you have to find the meaning." The dual medals, administered by the federal government, honor the achievements of those who have sought that meaning out, both for themselves and others. Since 1984, the National Medal of Arts has recognized "outstanding contributions to the excellence, growth, support, and availability of the arts in the United States," according to the National Endowment of Arts. The National Humanities Medal, which has been around since 1997, honors work that has "deepened the nation's understanding of the humanities and broadened our citizens' engagement with history, literature, languages, philosophy, and other humanities subjects." Each prize allows the president up to 12 selections every year — a limit President Obama saw fit to max out with this year's winners. Here they are, together with the citations that were read at the ceremony. Mel Brooks: "for a lifetime of making the world laugh. As a writer, director, actor, and musician, he pioneered the art of musical comedy, and his hilarious, thought-provoking work on film and in theater have earned him the rare distinction of winning Oscar, Emmy, Tony, and Grammy awards." Sandra Cisneros: "for enriching the American narrative. Through her novels, short stories, and poetry, she explores issues of race, class, and gender through the lives of ordinary people straddling multiple cultures. As an educator, she has deepened our understanding of American identity." Eugene O'Neill Theater Center: "for its unwavering support of American theater. For over 50 years, the Eugene O'Neill Theater Center has nurtured award-winning playwrights, directors, and actors, enriched the craft of stage production, and delighted audiences with exceptional programs." Morgan Freeman: "for his outstanding work as an actor, director, and narrator. His iconic stage and screen performances have brought to life characters from the whole spectrum of the human experience, moving audiences around the world, and influencing countless young artists." Philip Glass: "for his groundbreaking contributions to music and composition. One of the most prolific, inventive, and influential artists of our time, he has expanded musical possibility with his operas, symphonies, film scores, and wide-ranging collaborations." Berry Gordy: "for helping to create a trailblazing new sound in American music. As a record producer and songwriter, he helped build Motown, launching the music careers of countless legendary artists. His unique sound helped shape our Nation's story." Santiago Jiménez Jr.: "for expanding the horizon of American music. He has helped spread traditional conjunto music, blending the sounds and cultures of south Texas and Mexico. His lively melodies performed on the two-button accordion have captivated audiences around the world." Moises Kaufman: "for his powerful contributions to American theater. His work sensitively probes questions of culture and sexuality. His award-winning Tectonic Theater Project continues to move audiences with its bold portrayals of contemporary social issues." Ralph Lemon: "for his contribution to dance and the visual arts. As a self-proclaimed conceptualist, he uses dance as a source of physical communication, and his complex works withstand examination from all angles, revealing intimate truths about human nature and offering broader insights into the American experience." Audra McDonald: "for lighting up Broadway as one of its brightest stars. An unforgettable performer, she has won six Tony awards. In musicals, concerts, operas, and the recording studio, her rich, soulful voice continues to take her audiences to new heights." Luis Valdez: "for bringing Chicano culture to American drama. As a playwright, actor, writer, and director, he illuminates the human spirit in the face of social injustice through award-winning stage, film, and television productions." Jack Whitten: "for remaking the American canvas. As an abstract artist, he uses "casting," acrylic paints, and compounds to create new surfaces and textures, challenging our perceptions of shape and color. His powerful works of art put the American story in a new light." 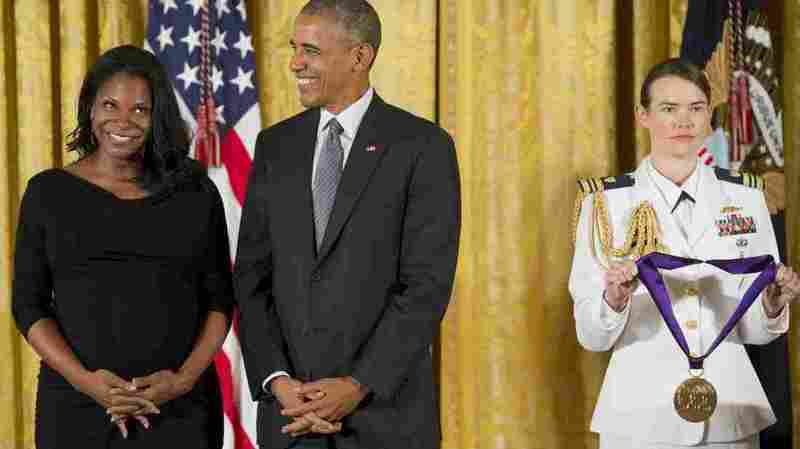 President Obama laughs as he presents actress and singer Audra McDonald with the 2015 National Medal of Arts. Rudolfo Anaya: "for his pioneering stories of the American southwest. His works of fiction and poetry celebrate the Chicano experience and reveal universal truths about the human condition—and as an educator, he has spread a love of literature to new generations." José Andrés: "for cultivating our palettes and shaping our culture. He has introduced new and vibrant ingredients to our Nation, whether through his innovative techniques in the kitchen, his work on clean cooking technology and access to education, or the inspiration he provides to new Americans." Ron Chernow: "for bringing our Nation's story to life. Through his examination of America's successful giants and titans, he also invites his readers to discover their failures and foibles, uncovering enduring lessons that inform our modern era." Louise Glück: "for giving lyrical expression to our inner conflicts. Her use of verse connects us to the myths of the ancients, the magic of the natural world, and the essence of who we are." Terry Gross: "for her artful probing of the human experience. Her patient, persistent questioning in thousands of interviews over four decades has pushed public figures to reveal personal motivations behind extraordinary lives—revealing simple truths that affirm our common humanity." Wynton Marsalis: "for celebrating the traditions of jazz music from New Orleans to Lincoln Center and beyond. As a virtuoso trumpet player, composer, and educator, he has brought jazz to a wider audience and inspired music lovers to embrace America's quintessential sound." James McBride: "for humanizing the complexities of discussing race in America. Through writings about his own uniquely American story, and his works of fiction informed by our shared history, his moving stories of love display the character of the American family." Louis Menand: "for prose and essays that invite us to think in new ways about the forces shaping our society. His influential works of intellectual and cultural history probe the power of ideas from one era to the next as they ripple across politics and culture. " Elaine Pagels: "for her exploration of faith and its traditions. Through her study of ancient manuscripts and other scholarly work, she has generated new interest and dialogue about our contemporary search for knowledge and meaning." Prison University Project: "for transforming the lives of currently incarcerated people through higher education. Its programs offer opportunity and inspiration to their students, providing an example for others to emulate." Abraham Verghese: "for reminding us that the patient is the center of the medical enterprise. His range of proficiency embodies the diversity of the humanities; from his efforts to emphasize empathy in medicine, to his imaginative renderings of the human drama." Isabel Wilkerson: "for championing the stories of an unsung history. Her masterful combination of intimate human narratives with broader societal trends allows us to measure the epic migration of a people by its vast impact on our Nation and on each individual life. "